The 6-24x42 AO Varmint Riflescope (Black Matte) from Barska is a perfect choice for many types of shooting including varmint hunting, target shooting, long range and precision shooting. The Varmint features an Adjustable Objective (AO) for parallax correction, a quick access magnification zoom ring as well as exceptionally high windage and elevation turrets. It has a 1" tube construction and comes with a Mil-Dot reticle. The click value adjustment of the windage and elevation turrets is ⅛ MOA. Its large objective together with multi-coated optics provides more clarity and greater brightness via increased light transmission. Waterproof, shockproof and fogproof, the Varmint riflescope is protected in all kinds of environments. And it's backed by Barska's Limited Lifetime Warranty. To use a riflescope with your firearm, you'll need a mounting base and mounting rings in addition to the scope itself. Bases attach to your firearm and the rings attach your scope to the base. Proper spacing of the rings, as well as the ring height should be considered to ensure a proper line of sight can be established. This will maximize the value of your investment, and enhance your shooting experience. It should be noted that in many mounting applications, a professional gunsmith's skills will be needed for proper installation. 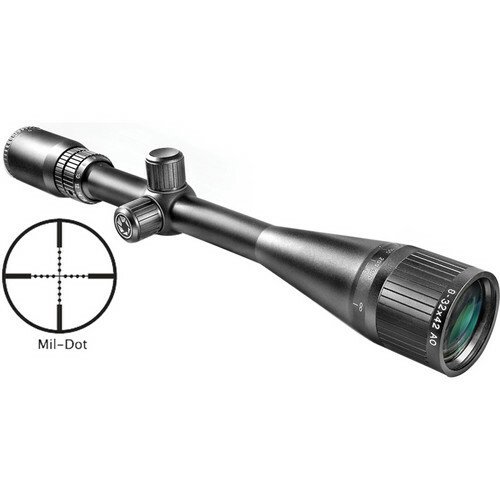 Box Dimensions (LxWxH) 17.4 x 3.1 x 3.05"
6-24x42 AO Varmint Riflescope (Black Matte) is rated 1.0 out of 5 by 1. Rated 1 out of 5 by granger from clear until i shot it looking at the target after mounting the scope I was impressed at how clear it was. After the first shot the scope went fuzzy I adjusted it took a 2nd shot the cross hairs went sideways.